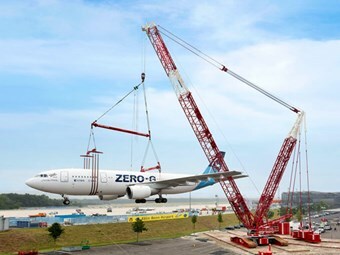 When the service life of a ‘Zero-G’ parabolic Airbus A-300 came to an end a Liebherr LR 1600/2 crawler crane was called in to lift the 82-tonne aircraft over a security fence at Cologne-Bonn Airport. The combination of cross beams and spreaders meant the Liebherr LR 1600/2 crane operator was able to adjust the angle to the appropriate centre of gravity using an electric chain hoist. Both the specifications for the crane job at the airport, such as its limited set-up height, and the requirements for attaching the sensitive load were very stringent, meaning the heavy load experts from Riga Mainz had to use a sophisticated combination of attachment equipment. In fact, Liebherr says there were only three attachment points on the entire aircraft with the required load capacity – both main sets of landing gear and an area at the front of the Airbus's fuselage. "The attachment equipment weighed a total of 19 tonnes and included two cross beams and three load spreaders developed by Riga Mainz," the company says. "A remote controlled chain hoist was used to adjust the crane hook precisely over the overall centre of gravity, even when it was loaded. This made it possible to adjust the required angle of the aircraft to the horizontal to generate no upthrust in the event of wind and inflows from the front." Over its one-hour ‘last flight’ over the fence the 54m Airbus was first turned almost imperceptibly slowly into its final position, then the LR 1600/2 crane had to crawl around 20m on a specially laid gravel bed. "Placing the future museum exhibit on three foundation points proved to be something of a long-winded procedure," Liebherr says. "Minor corrections had to be made to the construction before the crane driver, Markus Knabe, was able to position his unusual load with millimetre precision." Click here to find crawler cranes for sale.